Click here for high quality versions of all the photos on this website for use by journalists/publishers. Why: A trained dancer, gym instructor and Pilates teacher for 16 years, Gillian is sensitive to sports injuries. Classes are varied and lively, so you aren’t aware how hard you are working until the next day when your muscles let you know. With each new celebrity mum we witness an even quicker snapping back into shape. J-Lo apparently hired a team of nutritionists and trainers to help her loose the baby weight. Heidi Klum was back on the catwalk two months after having her second child. No presume for us regular mums then?! But whilst celebrities can afford the time and money required to speedily recapture their pre-baby body, most of us simply don’t have the scope for a quick solution. … Gillian Greenwood “London’s top Pilates therapist and well-being guru” (The London Paper) is based in South West London and runs classes in Fulham, Chelsea and Kensington. It is now one of the most popular exercise classes but comes in a bewildering number of varieties. Alice Hart?Davis identifies the best. Since Families SW featured her teaching postnatal body conditioning in 1993, Gillian Greenwood has trained in Body Control Pilates, given private lessons to Julian Clary and written a book, Her philosophy is to keep going back to the basic, to maintain the correct form throughout the exercise rather than perform a complicated choreography of postures. Gillian’s methods can help. among others. neck and back problems, the best possible medicine according to one student. Classes are held in 10?week blocks at an initial cost of £160 with possible loyalty and early payment discounts thereafter Private training at £75 per session also available. Chelsea, Fulham & South Kensington. Pilates works wonders for posture since it is all about balancing the body by getting some length into muscles which are over-tight and strengthening weak areas. The main focus is on the “core” – the deep muscles of the stomach and back which give the body its strength and stability. TIP: Tackle the basics first, such as how to use your abdominal and pelvic floor muscles. Pilates moves should feel subtle and not too strong. Why: You tend to show a lot more skin in summer, so tone up. Try Pilates like Liv Tyler. Treatment: A one-to-one private Pilates session at home with holistic health and fitness consultant Gillian Greenwood. Lengthening, softening and melting are three buzzwords used in Pilates guru Gillian Greenwood’s classes. Julian Clary, among others, swears by her lifestyle advice and claims to have achieved a body re-alignment and peace of mind through her instruction. And the great thing is, she’ll even come to your office. £35 for 30 minutes. Budokwai Club, 4 Gilston Rd, SW10. Local health and fitness consultant Gillian Greenwood – awarded the highest score in a London survey of Pilates instructors – is about to publish Pilates and Lifestyle. With a glowing introduction from client Julian Clary, the book is the first to combine safe, clear instructions for Pilates at home, with non patronising health and beauty tips. You also get Gillian to visit you at home. 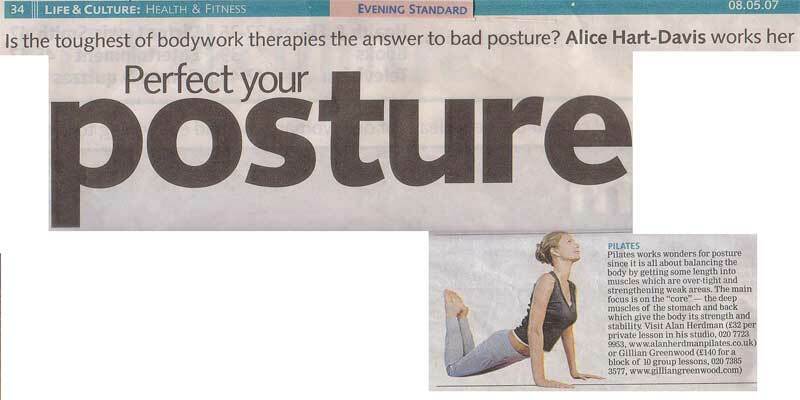 “TEACHER: Gillian Greenwood, who has trained in the Body Control Pilates method, and also teaches at other venues. “Gillian Greenwood holds workshops for mothers arid mothers-to-be, as well as for exercise instructors, teaching them how they can adapt their class exercises to accommodate them. These workshops are currently held in England, but Gillian is very keen to circulate her knowledge throughout Los Angeles by incorporating workshops in her visits to the States. The trouble with introducing new exercises into a pre/post-natal class, says Gillian, is that not all of the exercises suit everyone. The whole idea of the workshops is to explore just how many different ways a certain muscle group can be exercised or stretched. Tried and trusted exercises that are old favourites with the mothers are analysed to help the instructor discover what makes an effective, fun pre/post-natal class that keeps the moms corning back for more! The workshops provide the class members with a chance to give their opinions on the exercises. They can tell the instructors which movements they enjoy doing and what they consider is the ideal number of repetitions. The workshops are fun and very informal, giving everyone an opportunity to contribute ideas and opinions. Any instructors of pre/post-natal exercise who would like to attend Gillian’s workshops should send details of their training and type of classes they teach. “Little often and carefully is the key” said Greenwood, an instructor specialising in back care. “Part of the cause of back problems is that people are not taught these exercises properly. Its amazing how many people don’t know how to breathe out when pulling in their abdominal muscles or that pressing your lower back into the floor causes back strain. “Always keep your midsection strong and back still, by using your abdominals and breathing correctly” says Greenwood. “Keep repetitions to the amount you can do without your lower back participating. Exercises to avoid include standing toe touches, double leg lifts, and full neck circles. Back strengthening exercises are not as vital as abdominal ones and can damage the back if poorly executed. Approached carefully, they help relieve stiffness. Aerobic and body conditioning classes are not off limits for bad backs if you pay attention to form. “People push their arms forward and end up throwing their whole upper bodies forward – often heals don’t come down to the floor. So people shorten their Achilles tendons, causing the muscle imbalance in the body” says Greenwood. “Only use weights if you’ve perfected alignment and technique, and you really need the extra resistance. In the gym, ensure machines are individually adjusted. Cycling is fine, for instance, provided you are not hunched over low handlebars. Safest of all is swimming, particularly crawl; your back is supported and horizontal, holding your head above water will strain your back. “I have recently discovered the services offered by Gillian Greenwood, a masseuse and exercise teacher who will come to your home and arrange exercises on a one-to-one basis or for a group of friends. “It was kids stuff for these two midwives when they were put through their paces by health and fitness consultant Gillian Greenwood as part of a pre and post-natal exercise workshop. The workshop in the Echo’s exhibition hall at the Pennywell head office was aimed at educating expectant women on everything from fitness do’s and don’ts to decent diets. But there was also a physical side to the day with a series of exercises throughout the morning and a talk on cellulite problems during the afternoon. A mix of midwives and mothers went through the sort of exercises that are beneficial both during and after pregnancy.